This column is the sixth in our series profiling senior AI researchers. 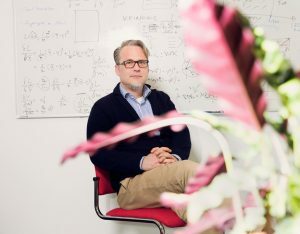 This month we interview Kristian Kersting, Professor in Computer Science and Deputy Director of the Centre for Cognitive Science at the Technical University of Darmstadt, Germany. After receiving his Ph.D. from the University of Freiburg in 2006, he was with the MIT, Fraunhofer IAIS, the University of Bonn, and the TU Dortmund University. His main research interests are statistical relational artificial intelligence (AI), probabilistic deep programming, and machine learning. Kristian has published over 170 peer-reviewed technical papers and co-authored a book on statistical relational AI. He received the European Association for Artificial Intelligence (EurAI, formerly ECCAI) Dissertation Award 2006 for the best AI dissertation in Europe and two best-paper awards (ECML 2006, AIIDE 2015). He gave several tutorials at top AI conferences, co-chaired several international workshops, and cofounded the international workshop series on Statistical Relational AI (StarAI). He regularly serves on the PC (often at senior level) for several top conference and co-chaired the PC of ECML PKDD 2013 and UAI 2017. He is the Speciality Editor in Chief for Machine Learning and AI of Frontiers in Big Data, and is/was an action editor of TPAMI, JAIR, AIJ, DAMI, and MLJ. When and how did you become interested in AI? As a student, I was attending an AI course of Bernhard Nebel at the University of Freiburg. This was the first time I dived deep into AI. However, my interest in AI was probably triggered earlier. Around the age of 16, I think, I was reading about AI in some popular science magazines. I did not get all the details, but I was fascinated. We were collaborating with biologists on understanding better how plants react to (a)biotic stress using machine learning to analyze hyperspectral images. We got quite encouraging results. The first submission to a journal, however, got rejected. As you can imagine, I was disappointed. One of the biologists from our team looked at me and said ”Kristian, do not worry, your research helped us a lot.” This made me proud. But also the joint work with Martin Mladenov on compressing linear and quadratic programs using fractional automorpishms. This provides optimization flags for ML and AI compilers. Turning them on makes the compilers attempt to reduce the solver costs, making ML and AI automatically faster. Physics, I guess, but back then I did not see any other option than Computer Science. That “sleep is for post-docs,” as Michael Littman once said. Artificial Intelligence = Machine Learning. What’s wrong with this equation? Machine Learning (ML) and Artificial Intelligence (AI) are indeed similar, but not quite the same. AI is about problem solving, reasoning, and learning in general. To keep it simple, if you can write a very clever program that shows intelligent behavior, it can be AI. But unless the program is automatically learned from data, it is not ML. The easiest way to think of their relationship is to visualize them as concentric circles with AI first and ML sitting inside (with deep learning fitting inside both), since ML also requires to write programs, namely, of the learning process. The crucial point is that they share the idea of using computation as the language for intelligent behavior. As you experienced AI research and education in the US and in Europe, what are the biggest differences between the two systems and what can we learn from each other? If you present a new idea, US people will usually respond with “Sounds great, let’s do it!”, while the typical German reply is “This won’t work because …”. Here, AI is no exception. It is much more critically received in Germany than in the US. However, this also provides research opportunities such as transparent, fair and explainable AI. Generally, over the past three decades, academia and industry have been converging philosophically and phys cally much more in the US than in Germany. This facilitate the transfer of AI knowledge via well-trained, constantly learning AI experts, who can then continuously create new ideas within the company/university and keep pace with the AI development. To foster AI research and education, the department structure and tenure-track system common in the US is beneficial. On the other hand, Germany is offering access to free higher education to all students, regardless of their origin. AI has no borders. We have to take it from the ivory towers and make it accessible for all. Deep learning has made striking advances in enabling computers to perform tasks like recognizing faces or objects, but it does not show the general, flexible intelligence that lets people solve problems without being specially trained to do so. Thus, it is time to boost its IQ. Currently, we are working on deep learning approaches based on sum-product networks and other arithmetic circuits that explicitly quantify uncertainty. Together with colleagues—also from the Centre of Cognitive Science—we combining the resulting probabilistic deep learning with probabilistic (logical) programming languages. If successful, this would be a big step forward in programming languages, machine learning and AI. AI is grown up – it’s time to make use of it for good. Which real-world problem would you like to see solved by AI in the future? Due to climate change, population growth and food security concerns the world has to seek more innovative approaches to protecting and improving crop yield. AI should play a major role here. Next to feeding a hungry world, AI should aim to help eradicate disease and poverty. We currently observe many promising and exciting advances in using AI in education, going beyond automating Piazza answering, how should we make use of AI to teach AI? AI can be seen as an expanding and evolving network of ideas, scholars, papers, codes and showcases. Can machines read this data? We should establish the “AI Genome”, a dataset, a knowledge base, an ongoing effort to learn and reason about AI problems, concepts, algorithms, and experiments. This would not only help to curate and personalize the learning experience but also to meet the challenges of reproducible AI research. It would make AI truly accessible for all. What is your favorite AI-related movie or book and why? “Ex Machina” because the Turing test is shaping its plot. It makes me think about current real-life systems that give the impression that they pass the test. However, I think AI is hard than many people think. The Special Interest Group on Artificial Intelligence of the Association for Computing Machinery (ACM SIGAI) and the Association for the Advancement of Artificial Intelligence (AAAI) are happy to announce that they have established the Joint AAAI/ACM SIGAI Doctoral Dissertation Award to recognize and encourage superior research and writing by doctoral candidates in artificial intelligence. This annual award is presented at the AAAI Conference on Artificial Intelligence in the form of a certificate and is accompanied by the option to present the dissertation at the AAAI conference as well as to submit one 6-page summary for both the AAAI proceedings and the newsletter of ACM SIGAI. Up to two Honorable Mentions may also be awarded, also with the option to present their dissertations at the AAAI conference as well as submit one 6-page summary for both the AAAI proceedings and the newsletter of ACM SIGAI. The award will be presented for the first time at the AAAI conference in 2020 for dissertations that have been successfully defended (but not necessarily finalized) between October 1, 2018 and September 30, 2019. Nominations are welcome from any country, but only English language versions will be accepted. Only one nomination may be submitted per Ph.D. granting institution, including large universities. Dissertations will be reviewed for relevance to artificial intelligence, technical depth and significance of the research contribution, potential impact on theory and practice, and quality of presentation. The details of the nomination process will be announced in early 2019. The Computing Community Consortium (CCC) announced a new initiative to create a Roadmap for Artificial Intelligence. SIGAI’s Yolanda Gil (University of Southern California and President-Elect of AAAI) will work with Bart Selman (Cornell University) to lead the effort. The initiative will support the U.S. Administrations’ efforts in this area and involve academic and industrial researchers to help map a course for needed research in AI. They will hold a series of workshops in 2018 and 2019 to produce the Roadmap by Spring of 2019. The Computing Research Association (CRA) has been involved in shaping public policy of relevance to computing research for more than two decades https://cra.org/govaffairs/blog/ The CRA Government Affairs program has enhanced its efforts to help the members of the computing research community contribute to the public debate knowledgeably and effectively. According to Reuters, Amazon scrapped an AI recruiting tool that showed bias against women in automated employment screening. In a recent post, we discussed the need for policymakers to think of AI and Autonomous Systems (AI/AS) always needing varying degrees of the human role (“hybrid” human/machine systems). Understanding the potential and limitations of combining technologies and humans is important for realistic policymaking. A key element, along with accurate forecasts of the changes in technology, is the safety of AI/AS-Human products as discussed in the IEEE report “Ethically Aligned Design”, which is subtitled “A Vision for Prioritizing Human Wellbeing with Artificial Intelligence and Autonomous Systems”, and Ben Shneiderman’s excellent summary and comments on the report as well as the YouTube video of his Turing Institute Lecture on “Algorithmic Accountability: Design for Safety”. Further work is needed to systemize and enforce good practices in human-centered AI design and development, including algorithmic transparency and guidance for selection of unbiased data used in machine learning systems.